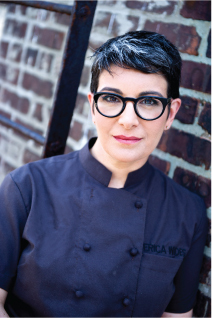 Erica Wides is the host and co-creator of Let’s Get Real: The Cooking Show About Finding, Preparing and Eating Food on the Heritage Radio Network. Known for her sarcasm, wit, in-touch attitude and matchless knowledge of everything food, Wides is a national authority on how to find, afford, cook and eat minimally processed natural foodstuffs, or real food. Often referred to as the Jon Stewart of food, Chef Wides specializes in taking the “whole-foods lifestyle” out of the realm of the food elite, and educating the public how to tell real food from processed food that is masquerading as real food or, Foodiness™. On Let’s Get Real Chef Wides clears a realistic path for anyone to have access to real food. …no chicken coop, bee-hive or home-grown vegetables required. In April, 2013, Chef Wides gave a TEDx talk in Berkeley, California called The Real Food Movement Needs To Get Real, co-written with Let’s Get Real co-producer, Christopher Nutter. As the host of Let’s Get Real Chef Wides has appeared on The Dr. Oz Show, BBC Radio 5, NPR, and Take Action News with David Shuster, and contributed to or been reported on in The New York Times, The Huffington Post, Grist, Yahoo’s Shine, Metro, C-Span and Food Republic, among others. A national media veteran, she has appeared on PBS’s Stress Free Cooking, Martha Stewart Morning Living, the Food Network’s Chopped and Top Five, and HSN TV; is a regular guest on NPR’s All Things Considered; and is a featured culinary expert for About.com. Chef Wides was also a Chef Instructor at the Institute of Culinary Education for 15 years. Let’s Get Real was co-created by and is co-produced with Christopher Nutter of Nutter Media. The show launched in September, 2011.